I must confess a big reason for looking forwards to returning here for the summer was that I would not have to deal with towing the trailer and looking for dumps and camp sites, etc. It might seem like a silly reason but it’s a major part of our travelling experience. So much so that your path is often dictated by it, so not moving as much saves you all of that. It’s a tremendous load of my mind, although I must say that it has been getting easier. Driving with the trailer and maneuvering it is becoming second nature. I’m not saying I’m good at backing that monstrosity up into a spot but I certainly know what works and what doesn’t. I still need to take a few tries to put it into a spot but I care less that it took that many times. I’m at peace with my comfort level and abilities in this department. We’ve also gotten quite proficient at finding places to stay and obtain water/dump. Our resources for finding these essentials has grown and made things easier. Within a few minutes we can make a better plan as to where we sleep and resupply. These might seem like little things but they add up in the stress department and can put me on edge. I knew this journey had to come this point of comfort or else it would make enjoying it quite difficult. Now that I’m here mentally, I can focus more on other things. One of the thing I noticed recently was that I would wake up in the morning and open the trailer door and realize I wasn’t where I thought I was. I often did not update our location in my mind as we travelled. Only when staying in one place for a few nights did it become familiar. When this happened early in the journey it was a reminder that I had no familiar place. Now it’s been adopted as a positive trait of a traveller. Speaking of which, many people have asked what the hardest things have been about travelling like this and I have not been able to process a real answer. After 7 months on the road I can definitively say it’s the loss of two thing: Familiarity and Comfort, at the same time. Camping for a weekend is a loss of comfort but you know the camp site and it’s exciting cause you know in a couple of nights your back home. You can certainly rough it for a short time. Going on vacation at a resort in a new place may not be familiar but you are usually lavished in comfort and that makes up for any loss in familiarity. When you lose both, for a long period of time, as soldiers do going to war, then it’s a mental burden that you must get use to over time. I’m not intentionally likening this experience to war, as that would be too dramatic, but in this sense it’s quite similar. But time is a great thickener of things. Through time we get complacent, we accept our new way of life and it becomes the new norm. Funny thing is that I’m sure all long term travellers experience this, yet in the blogs I’ve read, it’s rarely mentioned. Well, I’ve remedied that here. Another benefit to taking this rest from travel is the financial. We can use a break of gas payments and doing too many extra curricular activities. We just have to remember to eat out less to recover from these last few months of spending. Being back also allows us to go through many of the things we don’t need and sell them on Kijiji and eBay. That is much easier when you are not moving every day. I’ve abandoned relearning my piano skills and have decided to sell the keyboard and speakers I bought to free up space and focus on the guitar instead. That along with some other electronic items, plus one of my rifles, we have some things to sell to bring in extra cash. One of the things we did not look forward to coming back into Canada was the phone plans. We have $70 unlimited everything plan in the states, which has been pivotal in allowing us to avoid searching for hot spots and spending hours at McDonald using their wifi. It was going to be terrible to lose it. Luckily I overheard that someone with our same carrier in the US, talking about how he told them he was travelling in Canada for the summer and it wasn’t an issue. I called our carrier and got the same positive response. So far so good. My phone has been working well without any issues across the border. I have not written my thoughts since the challenging weather in Albany, Georgia. They haven’t changed much. No new revelations. Just moving along with my heart and mind open, being sanctified each new day with Gods grace. Our visit to our favourite radio pastor; James McDonald’s church in Chicago, has confirmed what we already knew, as he gave us advice on our travels. He said it’s about strengthening our marriage and family while waiting to hear God’s voice and obeying when and where we hear Him. It was encouraging to be comprehended. I sometimes get down a bit for not having a fulfilling job to focus on as I wait and travel. I never thought missing work would be a factor but I do feel useless sometimes. Luckily there is a charitable opportunity for me in Brooklin this spring. Our church here is updating it’s building and I will be taking the lead in that since I have been afforded this time off. Although our church is strong in the Word, our building looks more like a large utility shed then a place of worship. It certainly does not match the ministry inside. We are looking to make it more inviting. That should be very satisfying work for me. I look forward to serving in this way. Returning to Canada and going through the inventory of things we can sell to simplify and bring in some cash. One of my favourite rifles is one of those items set to sell. 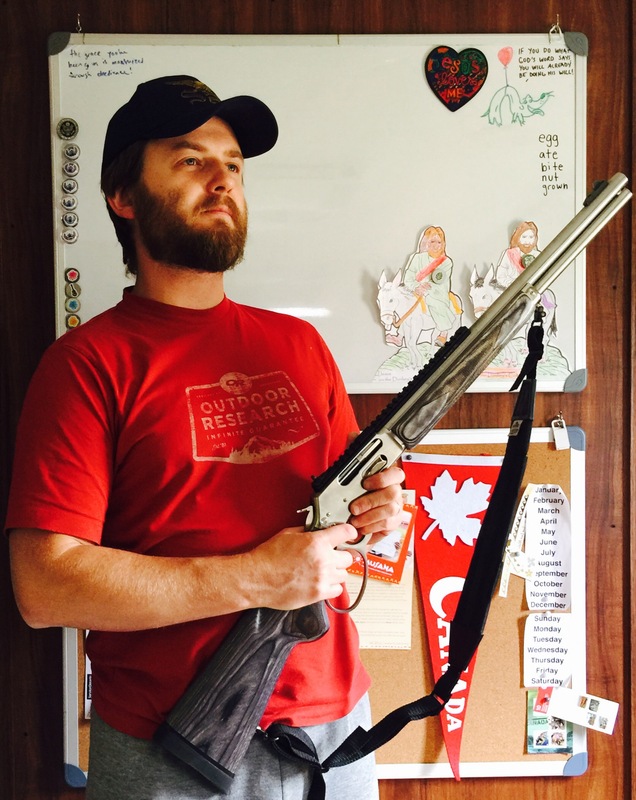 Isla took this picture of me with my last moments with my “Jurassic World / Owen Grady” rifle before it sold.